Don’t scoff when people talk about feelings. Respect – being valued by others – is a feeling. Feelings of respect bring respectful behaviors to life. Respect is earned slowly and lost easily. Show respect if you hope to earn respect. Move first. Be first to show respect, not to demand it. Leaders that demand respect have already lost it. Hold yourself accountable. The more authority you have, the less likely people will hold you accountable – to your face. Course-correct publicly when you screw up in front of others. Explore the impact of your presence on others. Pay attention to how you show up. Learn to adapt without losing yourself. Explore constructive dissent. Don’t take it personally. Honor those who work to make things better, even if they disagree with you. Identify with another’s distress. Don’t simply say, “It’s going to be OK.” Acknowledge that the issue is important. People feel disrespected when you belittle their concerns or distress. Don’t quickly tell people how to solve their problems. Be concerned and available, but don’t belittle their struggle by offering off-handed solutions. Honor strengths and successes. Don’t ignore the bad, just notice the good more frequently. Respect is earned when you honor another’s strengths, rather than flaunting your own. Honor the work of others, even if results disappoint. Practice social courtesies. Ask how people are doing. Focus on issues, not personalities, when tensions rise. Grab an oar. Sweat a little. Avoid making exemptions for yourself. How might leaders earn respect? Thanks Dolphin. It’s so easy to give ourselves special perks and permissions. At the same time, we crack the whip with those “under” us. That’s one sure way to lose respect. The more respect we lose, the more authority we need. Many organizations unconsciously reward negative behavior patterns. These patterns may be subtle but the common symptom in most of them is a lack of respect. 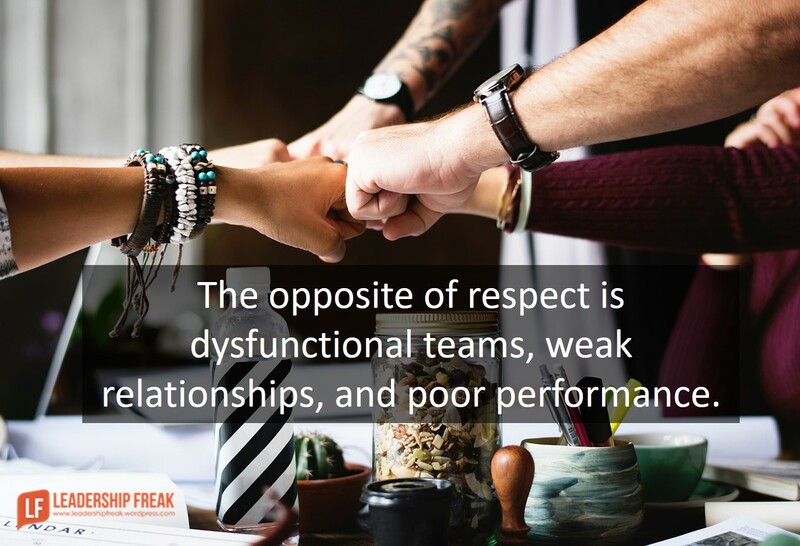 When it becomes a cultural norm, it is no longer considered dysfunctional. So what does respect actually look like? It employs constructive assertive healthy behaviors rather than passive or aggressive polarities and it is purpose driven rather than politically seeking self interest. It puts Dans words like “honor” and “accountability” in to action. Thanks Dan, another awesome post! Thanks Carol. Interesting that you bring up passive agressive. I hadn’t thought of how disrespectful that is to others. It’s so much better to be forthright, transparent, and candid. Respect develops over time as one works their way up the ladder. Depending on those who have worked with you, there may be times you have to start over, the older one gets the more difficult it becomes for “earning others respect” until you prove yourself to them. Granted most people have cordial/mutual respect for you, it’s getting to the ultimate respect when your willing to anything for someone without questions. Such as a General leading his troops in harm’s way, the ultimate respect! Thanks Tim. I think some people grant a general level of respect/courtesy at first meeting. What I get from your post is the deeper respect, the kind where people will put themselves out for you, takes time. Perhaps they have to see us put ourselves out for them. In my lifetime, what you surmise is true! I put myself out and others followed, we worked together, but it does take time for some to buy in. Time will develop the slow responders, others are more receptive especially when they see us put out the “sweat equity” beside them. A great post indeed. You can not earn respect by ignoring the need of your people. Respect is the byproduct of your action, intention and concern for people. You are absolutely right Dan. Designation does not earn respect, it is the person behavior that counts. You need to take an oar and sweet to get respect. You have covered points extensively, However, I would like to add here. Leaders also need to stand for others in their needs. This specially demands in their adverse time. Standing for someone in their good time, does not matter much. This makes leaders respectful and people stand for leaders. I think if there is one quality that breeds respect, it’s sincerity. In a world that is always trying to sell you something, whether you need it or not, sincerity is refreshing.